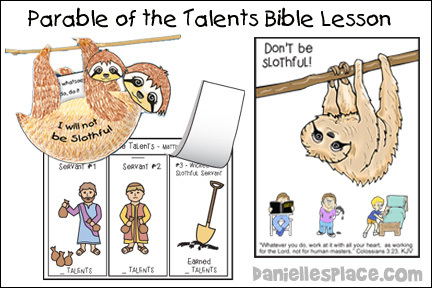 The following crafts and activities come from the Bible lesson, "Slothfulness - The Parable of the Talents" on The Resource Room. 1. Print out the body and head patterns onto card stock, cut them out, and color them. There are two head patterns for each sloth. There are two head patterns for each sloth - one for the front of the sloth and one for the back. They are numbered 1 and 2. 2. Use the body patterns as a template to cut from paper plates. Place the large body pattern on a 9-inch paper plate and the small body pattern on the 6-inch paper plate so the feet are at the edge of the plate and the rest of the pattern fits on the plate. Part of the pattern is missing because it doesn't fit on the paper, but it is not necessary if you place the feet at the edge of the plate. Trace another pattern on the opposite side of another plate or turn the pattern over and trace on the same side of another plate. You want the pieces to match up to make a 3-D sloth with an opening in the stomach. 3. Glue the body pieces together around the edge of the paper plate. 4. Glue the heads to the paper plate bodies. Glue one head to the front and one to the back matching them up. 5. Slip the baby sloth inside the mama sloth and glue her toes together. 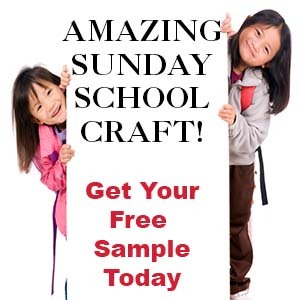 The coloring sheet contains the Bible verse, "And whatsoever ye do, do it heartily, as to the Lord, and not unto men;" with picture of children reading the Bible, painting, and making a bed. 1. Print out the color sheets and make copies. what they think the children are doing. Are they working with all their hearts as if working for the Lord? Note: Please do not say to your children that they shouldn't be lazy like the sloth. Sloths are not lazy. They only look lazy to us because they move slowly. 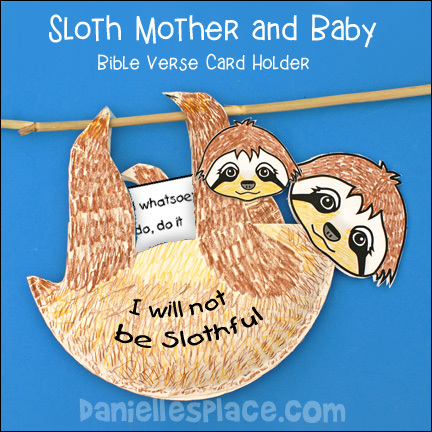 Instead tell your children that the sloth can remind us that God does not want us to be slothful or lazy. God has given us a creative mind and unique skills, and he wants us to use them to honor and glorify him. This book contain scriptures with corresponding pictures to help children learn about good stewardship in every aspect of their lives. On the first page of this activity sheet children color the pictures and count the talents. They lift the flaps and draw in the amount of talents each servant received and earned, and then write the number on the page. Printable pattern available to members on The Resource Room. Preparation: Print out pictures of sloths from the Internet, show them a video from Youtube, or find books in the library about sloths. In class show your children sloth pictures and ask them what they know about sloths. Sloths are the slowest mammals in the world. They spend most of their time hanging around in trees. They sleep 15 to 20 hours every day, and when they're not sleeping they often look like they are sleeping because they move very little. They eat leaves and fruit from the trees at night. They have a hard time getting around on the ground because their hind legs are very weak. To move across the ground they dig their front claws into the ground and pull themselves forward. They stay in the trees as much as possible because they can't protect themselves very well on the ground. The word sloth means laziness or not wanting to work. Sloths were named sloths because they look lazy, but sloths aren't really lazy. God made sloths perfect. They do just what they are supposed to do. God didn't make us like sloths. He gave us the ability to work and use our creativity to honor him. God wants us to work hard and use our abilities and creativity to honor him in all areas of our lives. 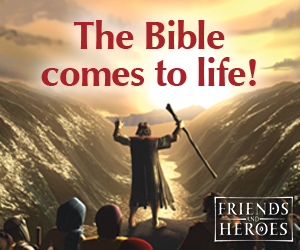 Jesus tells a story to explain how we should work hard for the Lord and be prepared for his return. Jesus said, "A man was travelling far away and would be gone a long time so he gave his money to his servants to take care of and watch over when he was gone. He gave each servant money according to his abilities. He gave the first one five bags of money (or talents), the second two bags of money, and the third one. The first servant immediately got to work and used the money to make even more money. The second did the same thing, but the third servant went and dug a hole and buried the money. After a long time the Lord came back and servants gave the man's money back. The first one said, "Sir, you trusted me with five bags of your money, I went to work and invested it and made five more bags of money." The Lord was pleased. He said, "Well done, good and faithful servant! You have been faithful in a few things. I will put you in charge of many things. Enter into the joy of your master." The servant with the two talents came and said to the man, "Sir, you trusted me with two bags of your money, and I used the two bags of money to make two more bags of money." The Lord was also pleased with this man. He said, "Well done, good and faithful servant! You have been faithful in a few things. I will put you in charge of many things. Enter into the joy of your master." Then the third servant who had only received one bag of money came to the man and gave him the bag of money he had been given and said, "Sir, I know that you are a hard man. I was afraid I would lose your money so I hid it in the ground." The Lord was not happy with this man and said, "You wicked and slothful (lazy) servant. If you knew I was so harsh then you should have at least invested my money in the bank so it could earn interest. The Lord took the money from the wicked man and gave it to the man with the ten bags of money. The man was lazy and did not understand who God was so he lost everything. The Lord said, "Throw him into the outer darkness where there is weeping and gnashing of teeth. This story isn't just about money. God gives us all certain abilities and blessings. And he wants us to use them to honor him. God wants us to work hard in all areas of our lives. He doesn't want us to be lazy or slothful. Intellectual - God gives us intelligence and he wants us to learn as much as we can so we can serve him to the best of our abilities. Spiritual - He wants us to study our Bibles, pray, and memorize verses so we can know him and are able to share our knowledge with others so they become believers. Physical - God made us, and he wants us to use our bodies to honor him. That means taking care of our bodies, eating right, exercising, working hard, and doing the best we can in every thing we do. to grow, to learn as much as we can, and to develop our talents to work for the Lord. He doesn't want us to be lazy. He wants us to do our best in everything, and when we do, he blesses us and gives us even more responsibilities. Before class Print Out the Jobs Sheet and cut the listed items apart. In class tell your children that you have a list of things that we can do to serve God wants us to do them to the best of our abilities. Have your children take turns acting out the scenes, and guessing what is being acted out. If you have children that can't read, take them outside the room and read the paper to them. You can also give them suggestions on how to act them out. 4. Practicing the piano or other instrument. 6. Feeding and taking care of a dog. 12. Telling other about Jesus. 13. Inviting a friend to church.